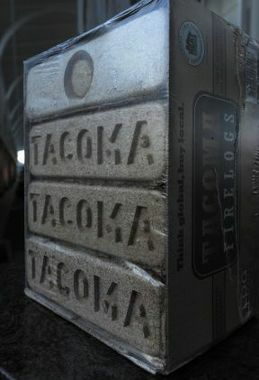 Made in Tacoma from mill leftovers, no waxes or glue just high pressure to hold them together. Try them out by the tidy box of 8 or stock up for winter with a 1 ton pallet of 696. 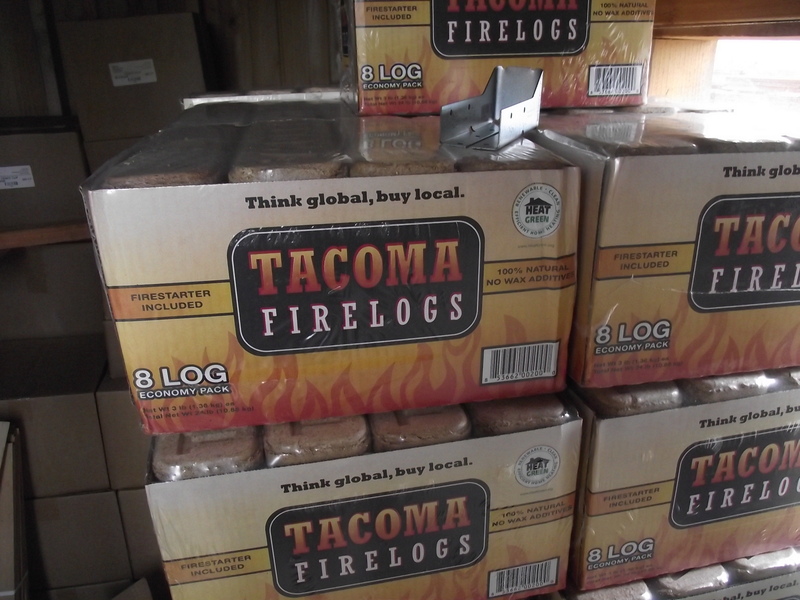 Mill Outlet is the outlet for Tacoma Firelogs. Made from 100% compressed sawdust here in Tacoma, they contain no waxes or binders that will deposit residue in your chimney and since they are bound together with nothing more than extremely high pressure you are assured to get consistent density and value for your money. Fans of fire logs will tell you that they are clean burning and clean to store with none of the dirt, loose bark or insects hitching a ride into the house every time you fill the firebox. And because they are consistently mixed and have very little moisture content they will not pop hot embers across the room to burn a hole in the carpet like cord wood is so famous for. Something I only learned recently is that compared to cord wood they are a superior option besides being cleaner and safer. a 1 ton pallet of firelogs contains 17 million btu’s of heating energy. That compares with 1 cord of Douglas fir at 17.4 million and Western Hemlock at 15.3 million or Alder at 14.8 million. Furthermore these numbers are based on seasoned wood moisture content of 20% which is as dry as split cord wood can possibly get. Is that the condition of your last load of firewood? 30 percent moisture is probably more realistic for most seasoned wood piles and 50% can be the case for freshly cut wood. Moisture content gas a dramatic effect on useful heat production. The average of Douglas Fir and Alder at 30% moisture content is 13.7 million btu and only 7 million btu’s per cord for 50% moisture content freshly cut wood. This is because up to 38% of the heat produced is only making steam which is going up the chimney instead of radiating heat. So if there was ever any doubt about the convenience and common sense in burning compressed sawdust for heat it is gone now. Is your product available in stores or for shipping? Do you have any retail outlets in Alaska? 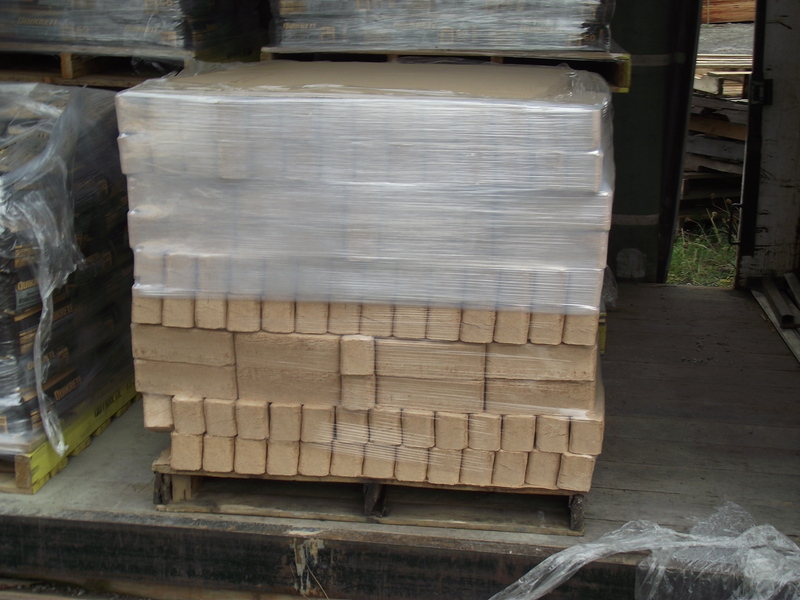 And if not, what would be an estimate on shipping for a 1 ton pallet shipped to Kenai, Ak (99611). I am not exactly sure what the shipping cost would be but I imagine it would be more than the cost of the logs. It would be great to develop a dealer up there and shipping full containers to someone like that would help keep the shipping cost down. Not that I am aware of but we were speaking to Mel’s Feed and produce in Battleground last year about taking truckloads and being a dealer there. Are there any dealers in Flagstaff, Az? I live in Wauna/Purdy area do you deliver, want 1 ton pallet Tacoma logs, what is delivery cost? What is the weight of the logs . And burn time for each one ?